Looking for Purple? Check the sale section! 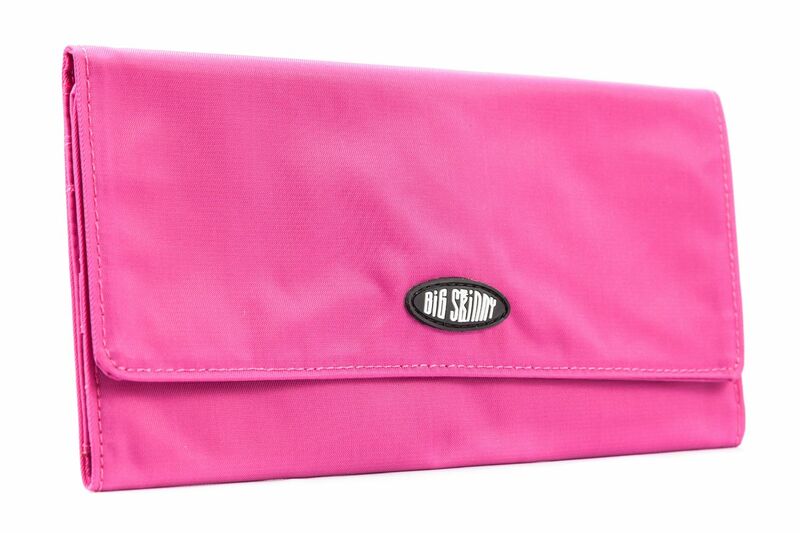 Read all the "best wallet, ever" reviews coming in for our Monte Cougar woman's tri-fold checkbook wallet from Big Skinny. 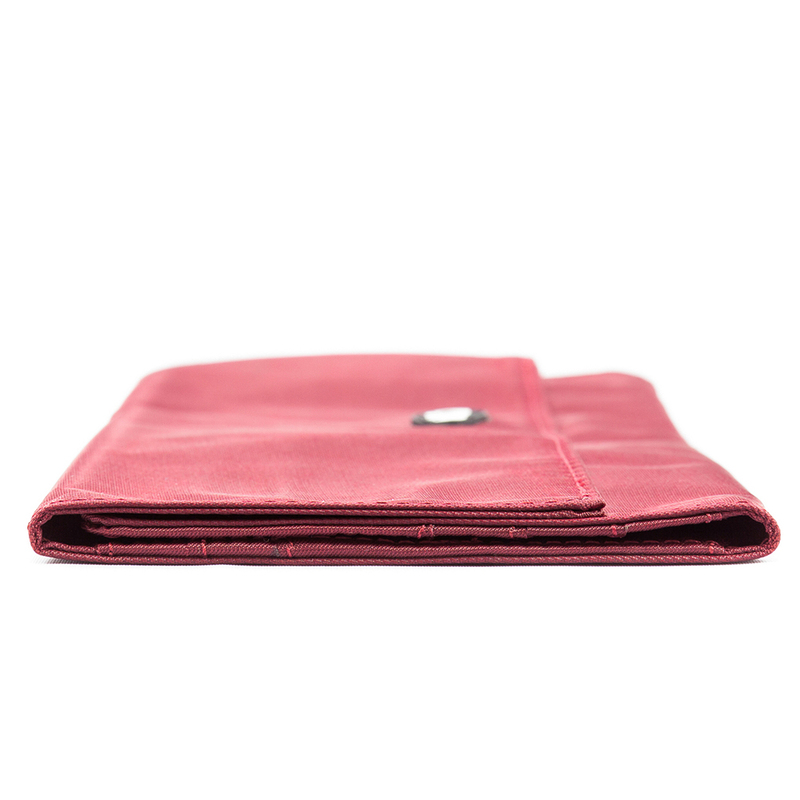 It's a practical and very pretty addition to our world's skinniest wallet collections. 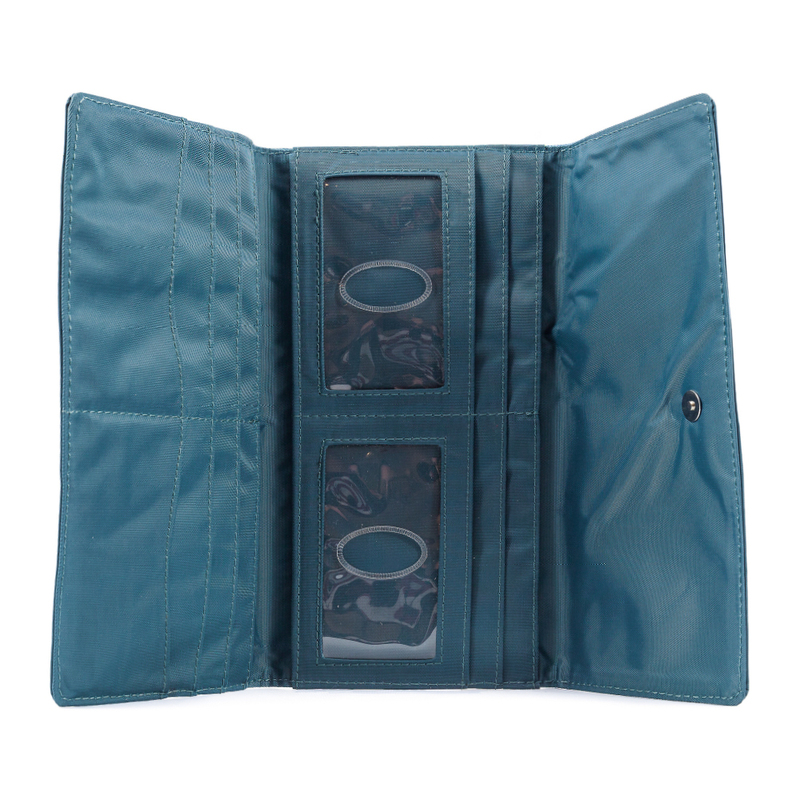 This tri-fold women's wallet will hold your checkbook, cash, coins and favorite essentials. 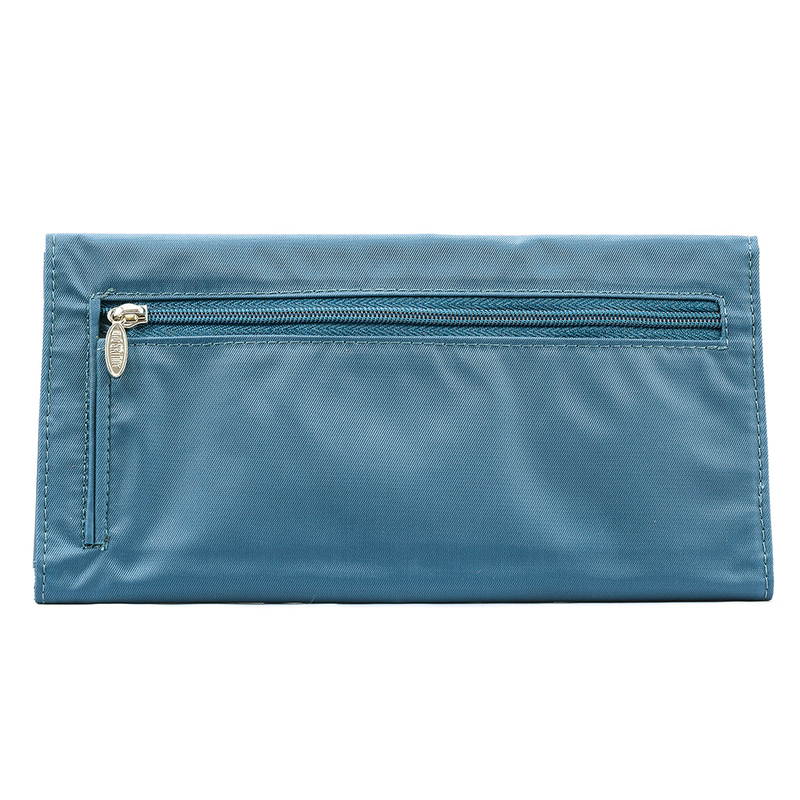 Sleek enough to use as a clutch for a night out. So, how do we get this extra large women's wallet to be so thin? It all has to do with our innovative design and brilliant raw materials. The primary material used to make the Monte Cougar is nylon microfiber. This is how we get the upper hand over every other wallet producer in business. Compare this checkbook wallet to a typical leather checkbook, and we're sure you'll be shocked to find our wallet is half the size of the regular wallet. 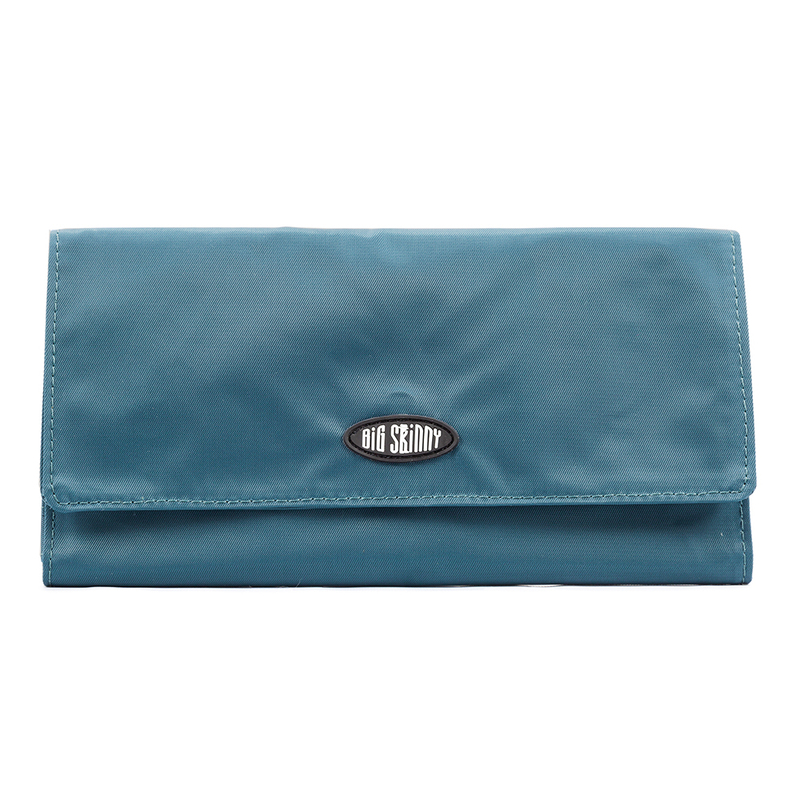 Nylon microfiber is a thin and durable material that cuts down on wallet girth but adds water resistance and durability. Spill you drink on it when you're on a night out? No problem! Empty it out, and throw it in the wash to clean it off! This wallet boasts a max capacity of 60 cards! Some of you shopaholics out there might be skeptical of this, but trust us, it's true. We've used a very smart tiered system to maximum organization and use of space. Let's say you're the kind of girl that could easily fill the Monte Cougar Trifold, how could you possible pull out any of your cards quickly and easily? The solution is extra-wide pockets! You will have easy access to all of it without the fear of anything slipping out - not with our exclusive no-slip grip pocket liners. 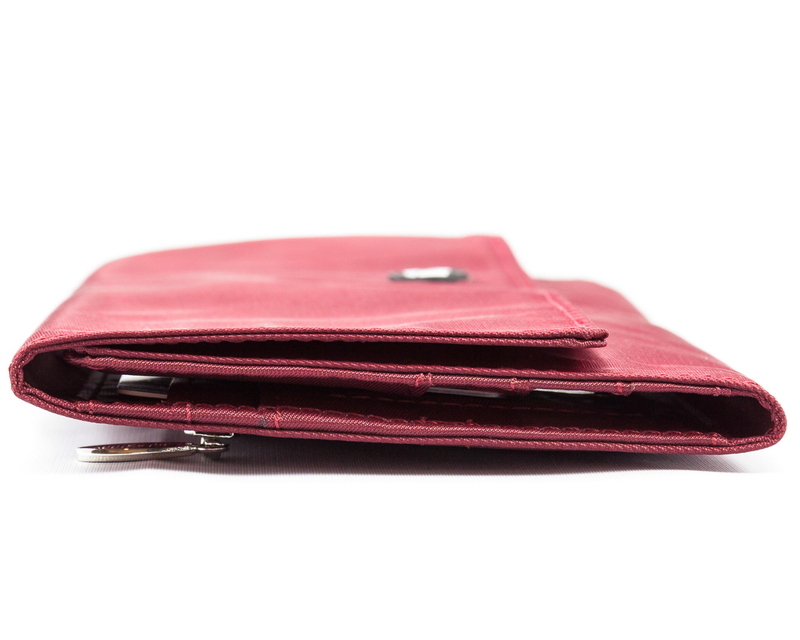 Our wallet is only 7mm thin (or 3/8) inch) when closed. This gorgeous tri-fold in electric purple measures 7 1/2 inches by 4 3/16 inches. 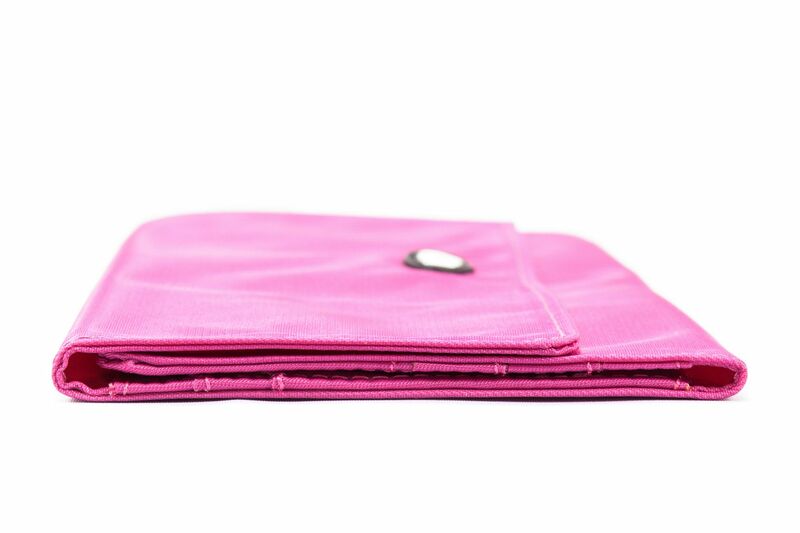 Though this wallet may be skinny, we actually like to think of it as one of our extra large women's wallets. 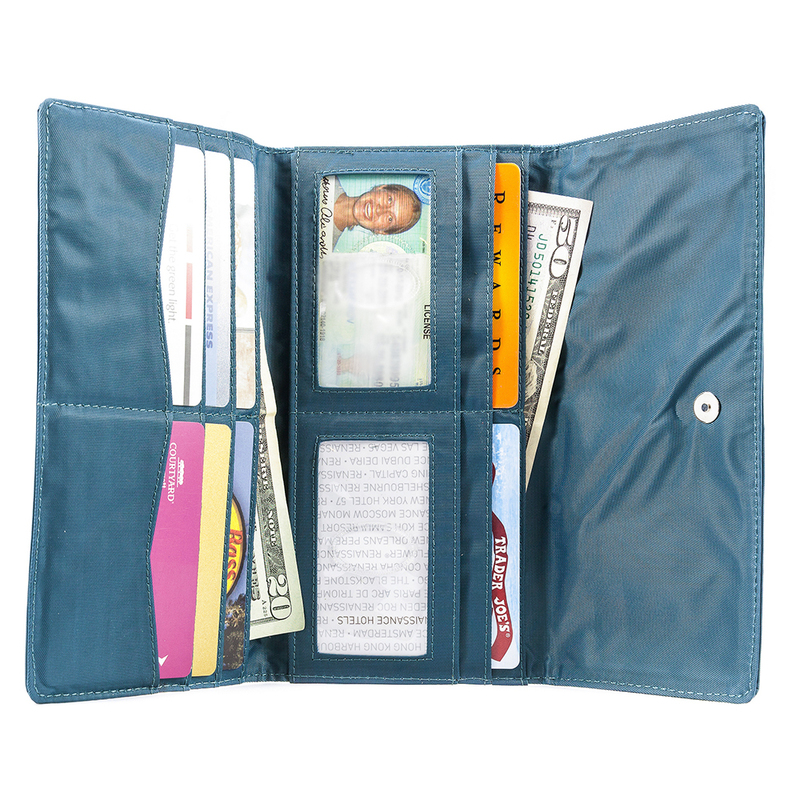 Our Monte Cougar wallet can hold up to 60 plastic cards in addition to your cash and coins. Instead of stacking your cards, you can divide them into special card holders to keep that slim, trim look without ugly bulges. A fashionable metal snap makes it easy to open and close. 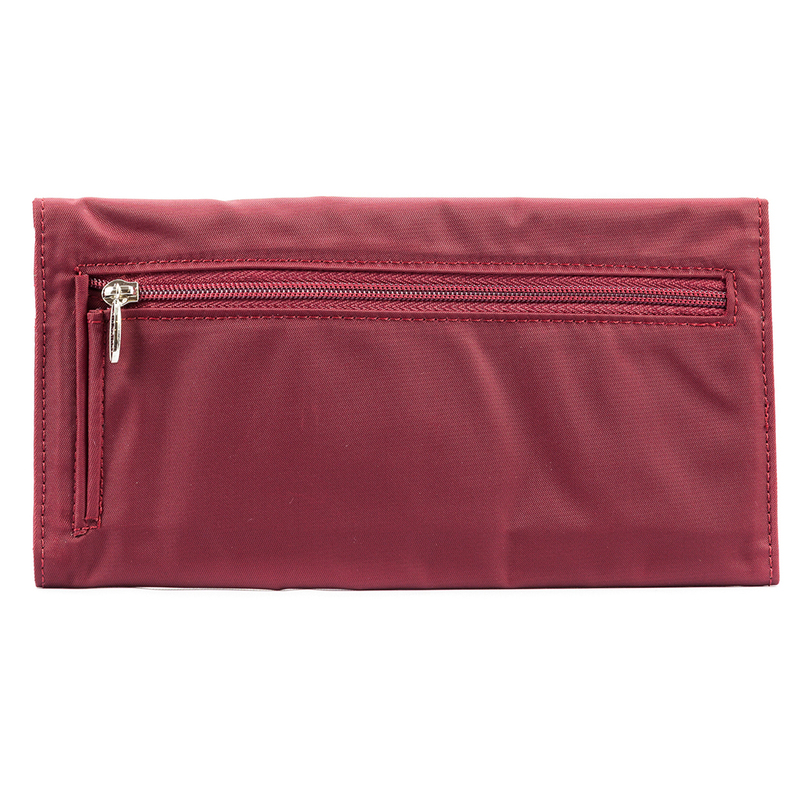 Inside our high tech nylon micro-fiber wallet for women is one general billfold/checkbook with a full-length separator. only 3⁄8" (7 mm) thin when closed! I was skeptical as to how lightweight and small this wallet could be, given I would be putting all the same stuff in it. Its amazing! Its flat! Its light! Without my $5 in quarters it would be virtually weighless! I love it. Just what I had been looking for. Very thin and light weight. Love the red color. I was skeptical that this wallet could hold all my stuff, but it does and, best of all , doesn't take up all the space in my smaller purses. ProsHolds all the essential things and then some. I love the Big Skinny wallet!! This is my second Big Skinny wallet. I bought my first one at the Harvest Fair in Miami many years ago. It fits all my items that I need and they never fall out. 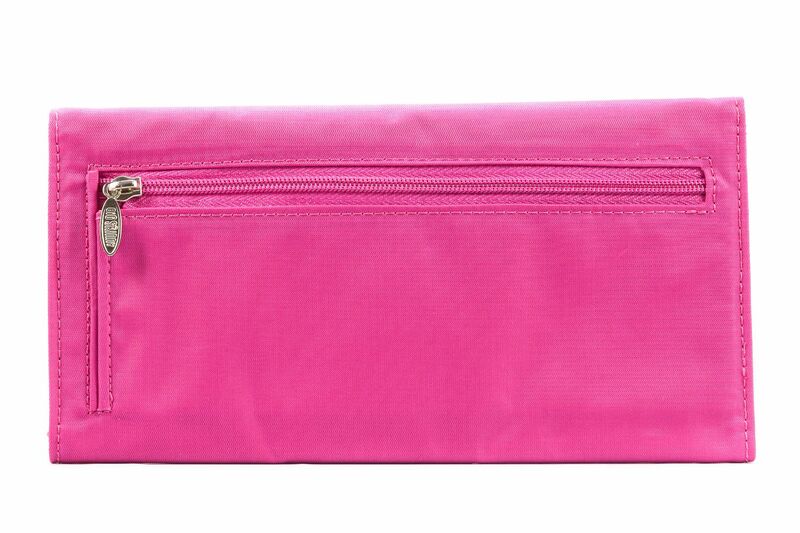 It is well designed, light, fits easily in pocket or purse. I really like my skinny wallets. I have looked a long time for a wallet like these. I bought three on the coast for cruising the coast for gifts and one for myself. The wallet is very light and holds lots of information.it is very flat,even with all my cards in it. It takes up less room in my purse. I have enjoyed my wallet and probably will buy more when mine wears out..
so much nicer than my previous fat wallet! Great wallet. I carry everything in it that I had in my old heavy, bulky wallet. Gave several as gifts this year! 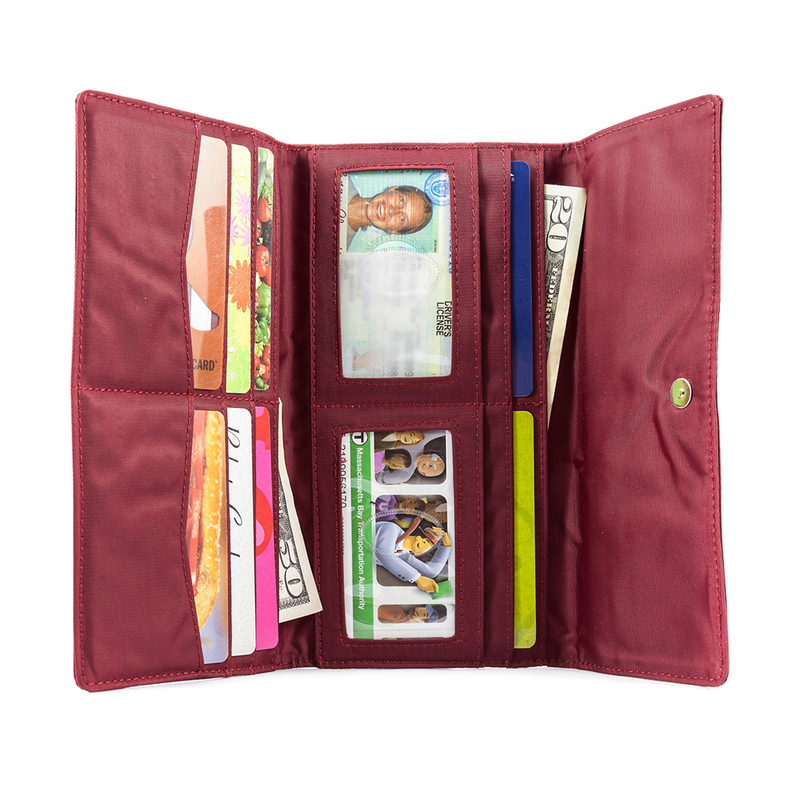 Has plenty of card slots and places for larger items. ConsSometimes I lose it in my purse because it is so slender! I have purchased your wallets before as gifts. Finally bought one for me. I am looking forward to lightening my purse. A lot lighter. My daughter's second one is about 3 years old. She still loves and said she doesn't need a new one yet. They hold a lot and hold up. ConsCoin pocket hard to get coin out without dumping into your hand. 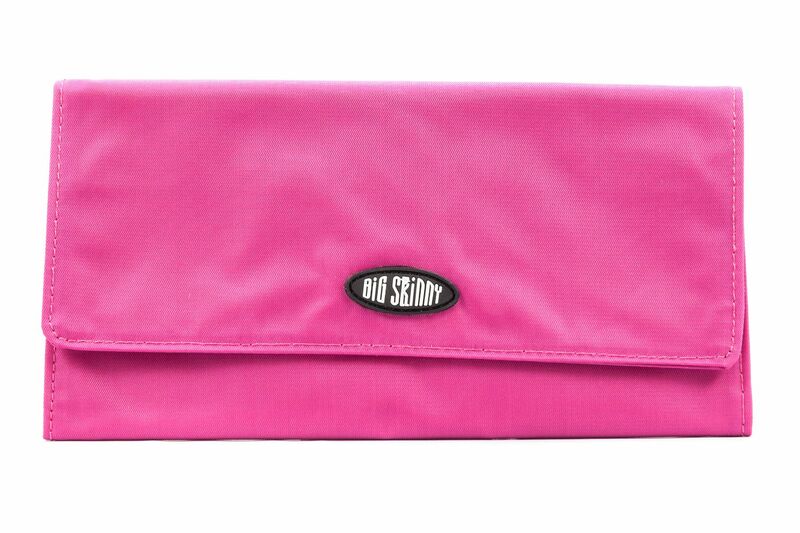 THANK YOU BIG SKINNY ONCE AGAIN for a FABULOUS WALLET!!! LOVE IT and the COLOR!!! 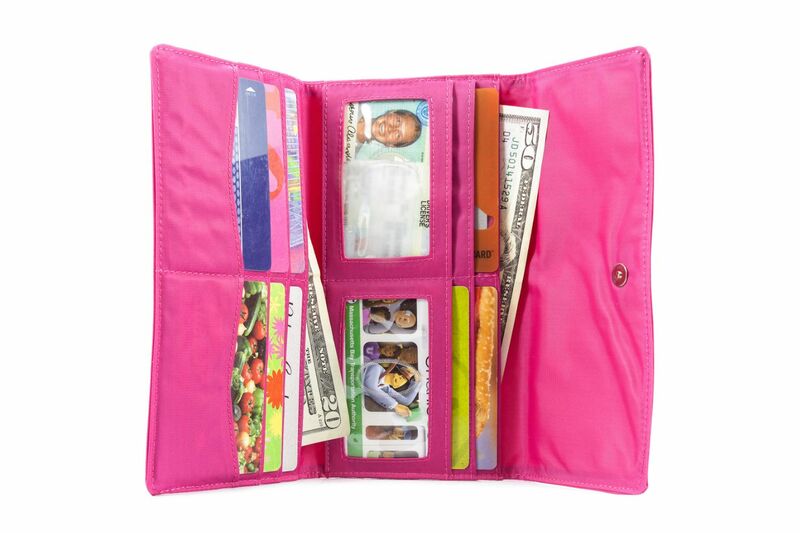 I can open my PURSE AND EASILY find this wallet!!! It holds all my "STUFF" and is still SKINNY!!!!!! !